ACM is the world’s largest computing society; it aims to bring together computing students, educators, researchers, and professionals to inspire dialogue, share resources and address the field’s challenges. This organization strengthens the profession’s collective voice through strong leadership, promotion of the highest standards, and recognition of technical excellence. ACM’s chapters provide unique opportunities for networking, mentoring and bonding over common interests. As such, we provide support both within the student community and to local communities outside the institution. Moreover, and as a women’s chapter as well, UOIT ACM-W supports, celebrates, and advocates for women in computing and other STEM fields. 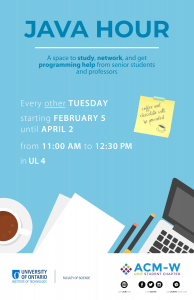 On a bi-weekly basis, we'll offer a space for students from any program to hang out, grab some coffee, and network with others with similar interests! Coffee & Hot Chocolate will be provided.